In our quest to profit from the land and feed a hungry planet with annual crops such as corn and soybeans, we have abandoned one of the most powerful conservation practices known to science – contour farming. Used since ancient times to slow the flow of water across the land to make it soak into the soil, contour farming is a method of planting crops across the slope of the land or perpendicular to the flow of water. The simple act of planting across the slope instead of up and down the hill does two very important things: it captures at least twice the rainwater and reduces soil erosion up to eight-fold. 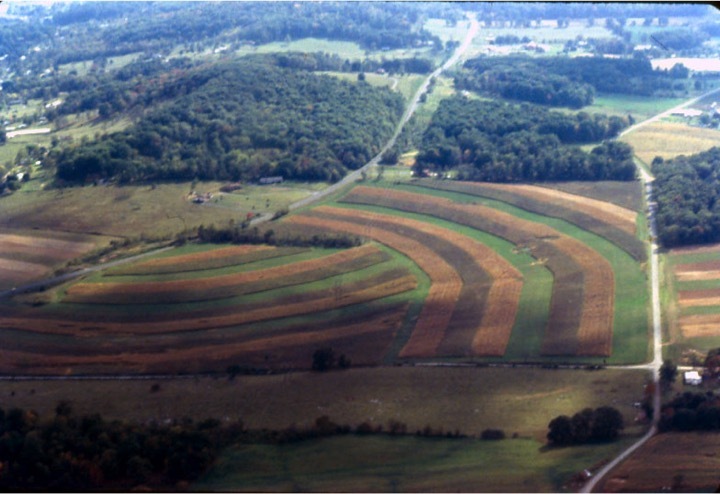 I laid out many contour strip cropping systems in my career with the Natural Resources Conservation Service, formerly the Soil Conservation Service. 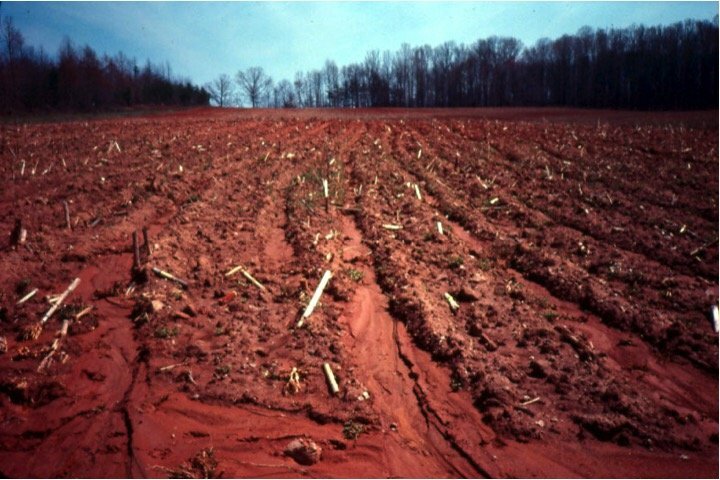 When I was working in Augusta County, Virginia some of our soils were very erosive, one soil, Berks-Weikert had a very low tolerance for soil erosion at two tons per acre per year. We call this the soil’s “T” value. The science of soil conservation is to develop a cropping system below this value. If the cropping system is below the “T” value for the soil then we are building soil health. Above the “T” value means we are losing more soil than we are making which is not sustainable. We can calculate the annual average soil erosion rate by using a formula agronomists call the Revised Universal Soil Loss Equation. In the late 80’s and early 90’s, I was working with a farmer in Stuarts Draft that had a lot of Berks-Weikert soil and it took every soil conservation measure we had to get his annual average soil erosion rate down to “T” or below. He installed a system using contour farming and alternating bands of crops and perennials. The picture above shows some of his contour, strip cropping systems. The farmer believed in building soil health; he wanted zero erosion. Many years later this farmer sold his land and a new farmer bought it. The new farmer did not want the contour strips because it took more time plant. He wanted to plant the whole farm in one crop. He said he would use no-till and didn’t need to plant on the contour. I did the calculations. His cropping system yielded an average soil erosion rate of 4 tons per acre per year. I informed him that he would not be building soil and eventually his soil resources would be exhausted. Unfortunately, the U.S. Farm Bill allows farmers to continue receiving USDA benefits as long as their soil erosion rates do not exceed 2 X “T”. Bottom line: the new farmer has twice the soil erosion that agronomists know is sustainable and still receives USDA benefits. I lamented as the strip cropping systems I laid out in Stuarts Draft were destroyed, replaced by a no-till, monoculture system. With the coming of “no-till” farming, I witnessed farmers taking out their contoured, curving bands of crops and abandoning the practice of planting on the contour. It was much faster to just plant in the most expeditious manner whether it be up and down the hill or around and around the field, this at the expense of capturing more water which is a priceless asset for crops in July and August. Farming is like making a fine cabinet; it takes a lot of tools: a table saw, planer, miter box, band saw, drill press etc. The cabinetmaker needs them all. A farmer planting annual crops on sloping land needs a lot of tools as well: no-till planter, cover crops, crop rotation, and…contour farming. Like the table saw in building a cabinet; contour farming is one of the most important tools in building soil health. In the 1938 Yearbook of Agriculture, “Soils and Men”, there is a table from an experiment where 11 inches of rain fell. The field that was planted on the contour captured 6.7 inches of the rain compared to only 2.1 inches from the non-contoured field. In another letter to Charles W. Peale in 1813, he wrote, “We now plough horizontally following the curvatures of the hills and hollow, on the dead level, however crooked the lines may be. Every furrow thus acts as a reservoir to receive and retain the waters, all of which go to the benefit of the growing plant, instead of running off into streams”. 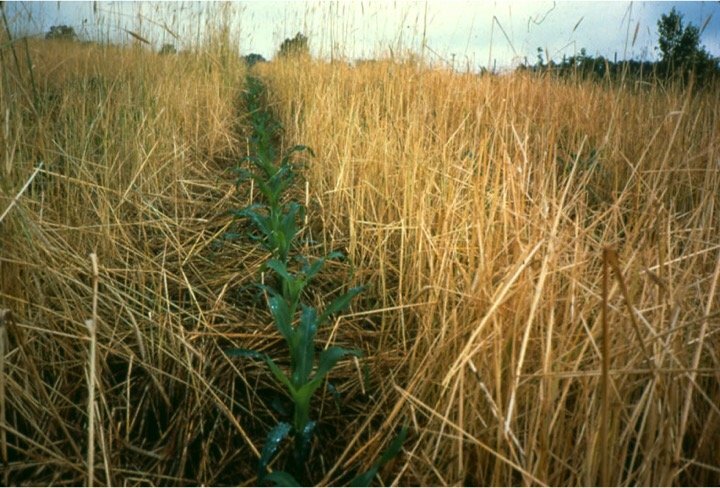 No-till farming is a great conservation practice but it is not the panacea of soil conservation. It takes a combination of conservation practices to anchor the soil and nutrients on the land where they belong – not washing away with rainfall into the streams where they become pollutants. Runoff from agricultural fields is one of the largest contributors of pollution to the streams in the Chesapeake Bay watershed. Planting annual crops such as corn, soybeans, and wheat have always had inherent risks for soil erosion and polluted runoff because they have to be planted every year. The steeper the land is, the more conservation measures need to be applied to the land to reduce erosion and increase the infiltration of water into the soil – contour farming achieves both. To get help with contour farming and other Best Management Practices contact your local Soil and Water Conservation District or USDA office. Nice article Bobby. There is so much about stewardship of the land that is just simple and common sense practice. These old “technologies” are far too often cast aside by the promises of new precision, high tech chemicals,maximizing production, and short term thinking. Protecting streams with buffers, maintaining soil cover, and working with the contours of the land alone can get us a long way to our goals for healthy and sustainable watersheds. Al, thanks for stopping in and for your comment. All so true. What a shame that the new farmer discarded such soil-building practices in the name of convenience. Short-sighted, indeed. I hope more people learn to appreciate how landscaping can help or hinder soil. I know I’ve just begun and it has really opened my eyes. Thanks for stopping in Katie and for your comment. Right on! Thanks, Cory. I lament that RUSLE II gives practically zero credit for contouring when no-till is used. The P value in RUSLE is so low. We only get a good P value when there is clean tillage and high ridges. I cannot believe that the P value is so low when no-till is used. I’ve seen it on the land. Combining no-till and contouring is the way to go. And let’s not forget rotation and true no-till which incorporates a lot of residue. My former supervisor, Roger Montague sent me the following email and gave me permission to post it here. Interesting timing, very good article, and no argument from a fellow conservationist concerned about resource conservation. I think you are spot on. But the sad thing is that for the most part, you are preaching to the choir. Keep on doing it though! Hope I don’t offend you. Seriously, I’m getting a little cynical in my old age. I honestly think my downfall in VA, much of which I caused, has soured my outlook on some things, notably NRCS and SWCDs. It’s a shame to put such an important job in the hands of those two entities. Too bad they are not staffed by 10,000 Bobby Whitescarver clones. Also (tongue in cheek) which RUSLE is being used? The one before or after Wilson Scaling? On another note, it’s a lot about marketing and sales. USDA was once good about the scientific part of resource conservation (not sure anymore), but based on my time INSIDE private industry, USDA is pitiful at marketing unless it’s marketing to each other at a meeting. It was the charisma, political savvy, and marketing skills of Dr. Bennett that got the soil conservation movement started on a national basis, not some scientific paper on contour farming. If I am anywhere near right on marketing and sales, think about the struggle to provide sales training in NRCS. It’s intuitive to you now to use sound sales/marketing techniques. You don’t have to think about it. But 99.9% of NRCS thinks sales training can be accomplished in one afternoon. And on marketing why couldn’t resource conservation sponsor a team in the Tour de France? The Postal Service did. Why can’t resource conservation sponsor TV ads during the Super Bowl? The military does. Oh yes, Bobby. I lived out west of H’burg for many years. Although a lot of it is Mennonite country, and although they are often good and careful family farmers, there was very little contour planting going on, for all the reasons your farm buyer mentioned. I gnashed my teeth for years at the evidence of erosion at Silver Lake. The farmer on the far side of the lake grew corn year after year, with rows leading straight down to the lake, which of course is full of algae every summer, and growing shallower all the time. Anne, good to hear from you and your story is priceless. Thanks for posting. There is value in tradition and following the ways of those who came before you, but there is also value in innovation! I feel that those who are not open to new ways eventually get left behind. It’s sad to me that it takes a destruction of the land and soil to open peoples eyes to the benefits of planting on the contour. If they had been receptive to this contour method in the first place they could have better preserved their soil. It is a shame that the USDA supports farmers who allow for soil erosion on their fields of up to 2X T. Maybe if the USDA made their limit on soil erosion a little more strict it would prevent such immense soil loss as farmers might modify their practices in order to quality for financial benefits. Bobby, great article. I farm organically in Powhatan, Virginia and just finished chisel plowing our fields that were designated highly eroding and lived under CRP for many years. We just had over an inch and a half of rain and guess what? No erosion, even on the steepest slopes. Contour plowing is time consuming and can be confusing, but if you’re not ready for organic no-till (Johnson Grass infested) it’s the only logical option. Pete, thanks for stopping by and posting your comment.